Automatic pressure generation and control to 300 psi (20 bar, 2 MPa). Enter a pressure and the 729 automatically pumps to the desired pressure. Fill in a test template and the 729 will automati­cally pump to and document a multiple-point pressure calibration test. Easy calibration documentation using defined templates for transmitters and switches. Type in the starting and ending test pressures and number of test points. The 729 does the rest by documenting the applied pressure, measured mA and % error for each test point. The bright color graphical display will flag out-of-tolerance test results in red. Automatic internal fine pressure adjustment helps compensate for minor leaks in hoses and test setups. No need to manually turn a vernier to compensate for leaks helping to eliminate the hassle of manual pumping and manual fine adjustment of test setups. HART communication enables mA output trim, trim to applied values and pressure zero trimming of HART pressure transmitters. You can also do light configuration tasks such as changing a transmitter tag, measurement units and ranging. Other supported HART commands include setting fixed mA outputs for troubleshooting, read device configuration and variables and read device diagnostics. Measure mA signals on transmitter outputs, source and simulate mA signals for testing I/Ps and other mA loop devices. 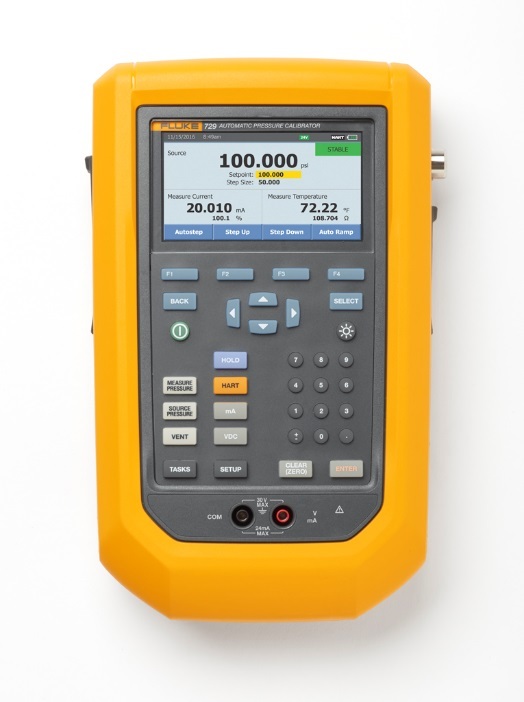 Includes a 24V loop power supply for testing and powering transmitters in standalone tests disconnected from the control system. Rugged portable design and 3-year warranty set the 729 apart from most other pressure calibrators. The 729 is tested and warranted to withstand a 1-meter drop test so it is ready for field instrumentation calibration work. 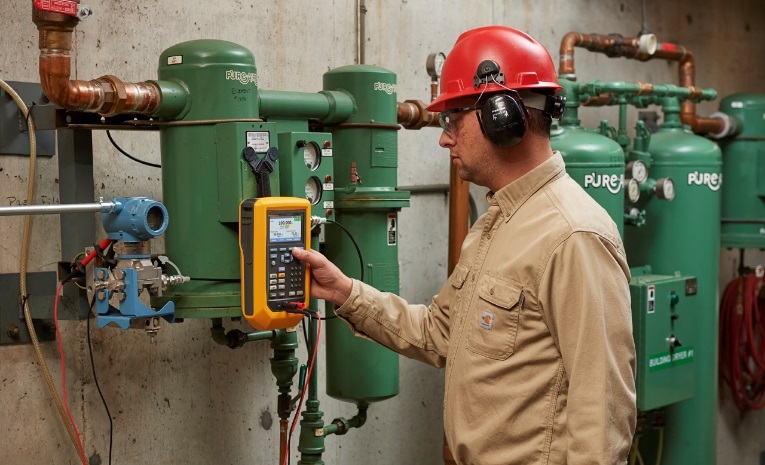 Fluke Connect® compatibility enables a user to perform remote monitoring using the Fluke Connect mobile app and also manage and store pressure measurements and logging events. Share measurements using ShareLive™ video calls and emails. Measure temperature with optional 720RTD probe for performing custody transfer calibrations. Measure pressure with legacy 700 Series and the 750 Series pressure modules, if different pressure measurement ranges or resolution is desired. Multiple language support: select language from the instrument setup utility. Hart communication commands are limited to English per the HART device descriptors and protocol. Semi-rigid carrying case designed for field work, with room in the case to store test hoses, fittings, test leads and small hand tools needed for field pressure calibrations.